This is a light refreshing meal for summer nights when it’s too hot to eat heavy or want to mess with makin the house too hot. First, make your zoodles however you make them – I have a gadget that allows me to shred zucchini like I’m sharpening a pencil. Salt the zoodles, toss, and set in a colander to drain. On to the chicken. Cut into bite-sized pieces, salt and pepper liberally, and place in a large skillet (along with a Tablespoon or two of fat) over medium-high heat. Sautee until browned and cooked through. While the zoodles are resting and chicken is working, make the pesto. Add to the bowl of a food processor: juice & zest of the lime, a big hand full (about 1/2 cup) of basil, the garlic, red pepper flakes, a couple big pinches salt, a few cracks black pepper, the honey, and a couple good glugs of oil. Process until pesto, adding more oil if necessary. Taste and adjust seasoning as needed. 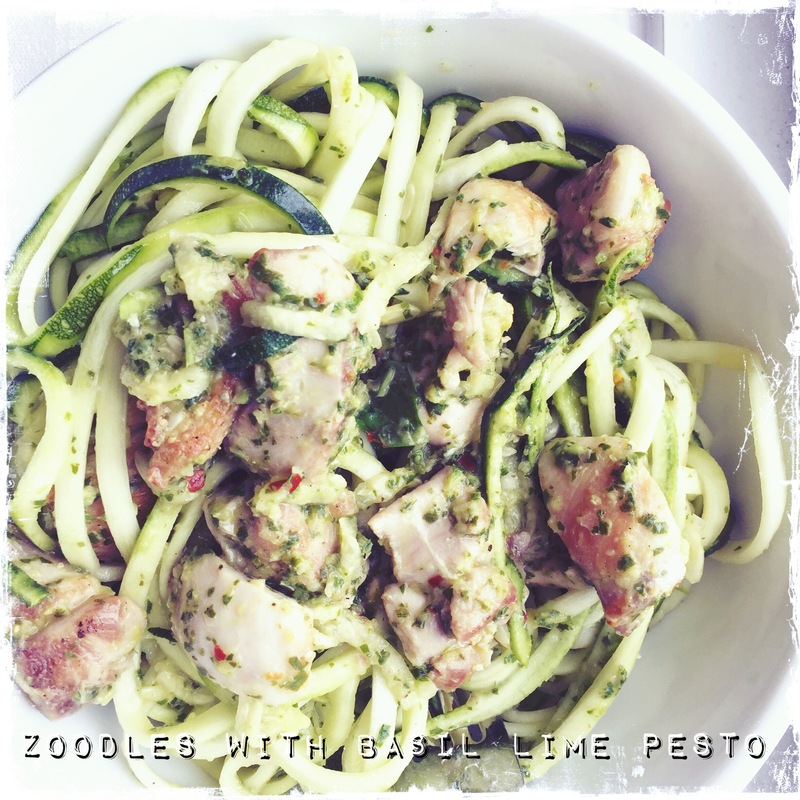 To serve, toss the zoodles with the chicken and pesto.